He's the upper left icon on the map, or the only icon remaining if you're following this guide closely. Go right and fight the Notor Bangers, then onto the elevator and up past the Head Gunners. You won't be able to use this if this is your first time here, but above the exit of the elevator is the platform for summoning Ride Armors. 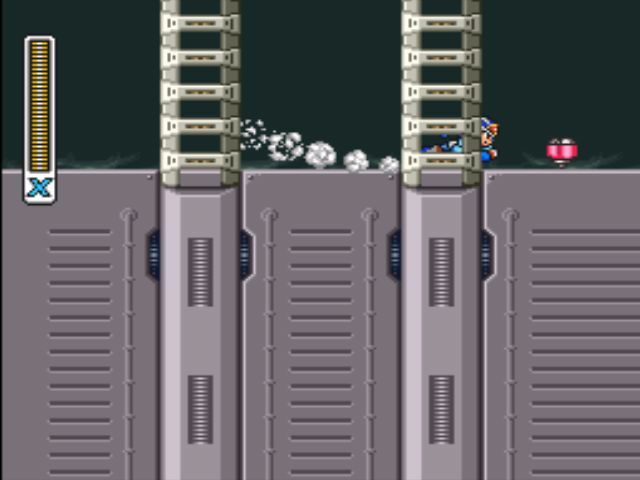 Head right into an area with conveyor belts. This is tricky. Go all the way to the right end of the top conveyor belt. There are spikes above you on the wall. 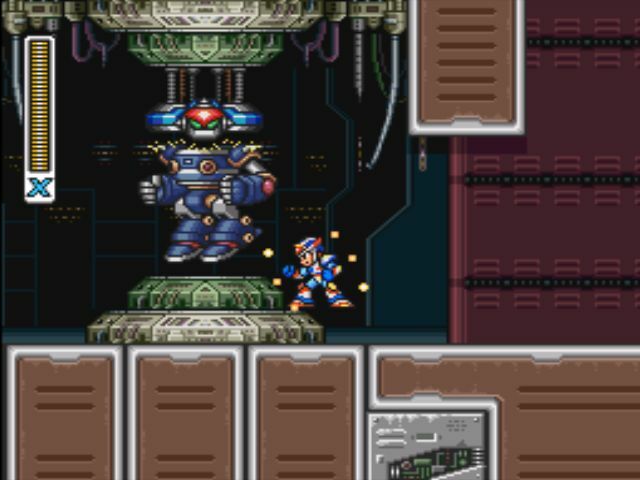 Get as close as you possibly can without touching them and wall jump off, then air dash as high as possible and grab the wall directly above them to wall jump up to the capsule with the chip in it. This one is the best one you can get that isn't the gold chip. It will gradually refill your life meter and sub tanks while you stand still. It takes a while, but it means you can go into every boss room with full health and tanks. If you're going to get a non-gold chip, it should probably be this one. But since you can only have one chip, it's probably still best to wait for the gold one. Head down the conveyor belts, fighting Notor Bangers, occasionally picking up some health if you want it. There's some health in the lower left corner next to a pit. Don't fall in the pit. Go right to fight a miniboss. The little enemy that flies in here is called Genjibo. That's not important. You won't actually fight him. He'll project a wire frame enemy called a Shurikein into existence. That's your target. It can roll around the room, occasionally hopping, slowly roll all the way around the perimeter of the room, or spin around hopping like mad. It will always start by doing those first two attacks in that order. It's weak to the Acid Burst. Hang on to the upper left part of the wall and shoot the Acid Burst from there until it stops rolling around. Then jump over it when it's about to climb the wall. Remember that you can aim this weapon directly up. If you're quick, it will never get the chance to use its third attack. Head right through the door. Climb the building and deal with the flying enemies and Notor Bangers. These blocks can be destroyed with a few shots. The second set of blocks will destroy a part of the floor. Drop down. Use the Tornado Fang to destroy the wall on the left. Destroy the box and hop down, then destroy the thing holding the Ride Armor. Hop in. Now you'll be able to summon Ride Armors from the pads in each of the Maverick stages. The Chimera Ride Armor is the most basic one. It can pretty much just dash, jump, and punch. It's still a force to be reckoned with, however. Head up the elevator on the left and punch your way out of these buildings. Head all the way to the right. If you didn't beat Gravity Beetle before coming here, you'll have to fight a... miniboss? It's actually just a small robot that loads boxes onto an aircraft. Destroy the boxes. I guess. I honestly don't know what the point of this is. Once this part is over, continue right. Head to the right building and jump in the Ride Armor, then hold up and jump out of the Ride Armor while it's in the air, and air dash up to climb the wall. The heart tank is on the top of the wall. Continue to the right. 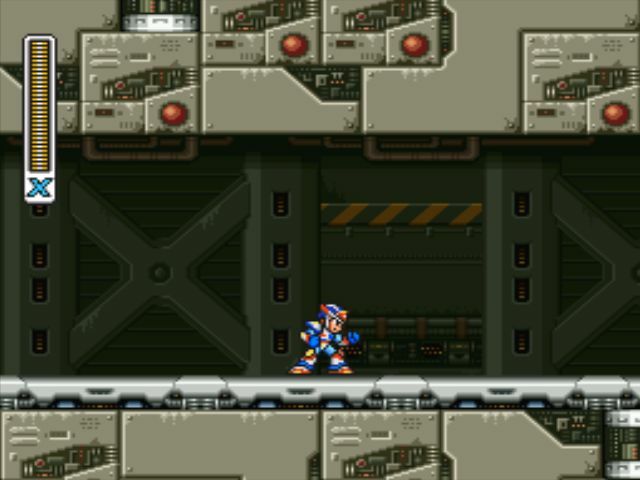 If this is your last Maverick stage and you haven't fought Byte yet, he's waiting for you on the other side of this door. Otherwise, it's another empty room to pass through. Head down past some more conveyor belts and Notor Bangers. There's a Head Gunner down below, next to a pit. More Head Gunners and some boxes. The first stack is harmless, but the rest will cause a mini avalanche once you destroy them. Destroy them and wait for a box to fall and explode and then dash past. Deal with these boxes and Head Gunners and go. The boss awaits. This guy does a lot of damage, but he's pretty harmless if you have his weakness. His stinger does lots of damage. Don't let him sting you. He flies around the room in a horizontal figure eight and takes up a lot of space so he's hard to avoid. He sprays out clouds of tiny hornets that will grab onto you and continue to damage you until you destroy them with a charged shot. The ones that don't hit you will hang around the wall and floor for a while, still damaging you if you touch them. After his life drops to 50%, he'll release an aiming reticle. If this locks on to you, his hornets will home in on you. You can get a head start by charging up your Gravity Well before even entering the room. When the fight starts, let it go to do a nice chunk of damage. Then just spam regular Gravity Wells. They'll hit him no matter where he is in the room and make him flinch. 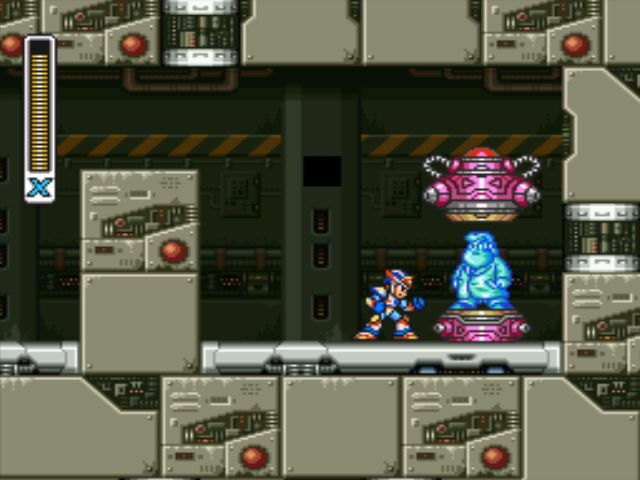 Stand next to the Gravity Well and it will return to X quicker, meaning it can be redeployed quicker. Don't let up and you probably won't even take a hit. This will latch on to small enemies and explode. If there's another enemy nearby, it will carry the first enemy and slam it into the second enemy and destroy them both. Neat! 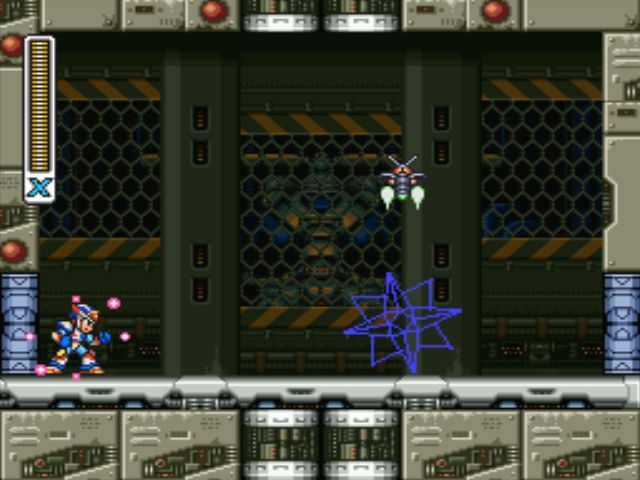 If you charge it, homing reticles will appear around X and target enemies, sending tiny hornets after them. Look at your map and clean up any loose ends. If you didn't have the Ride Armor before now, get the heart tank from Crush Crawfish's stage and the sub tank from Volt Catfish's stage. 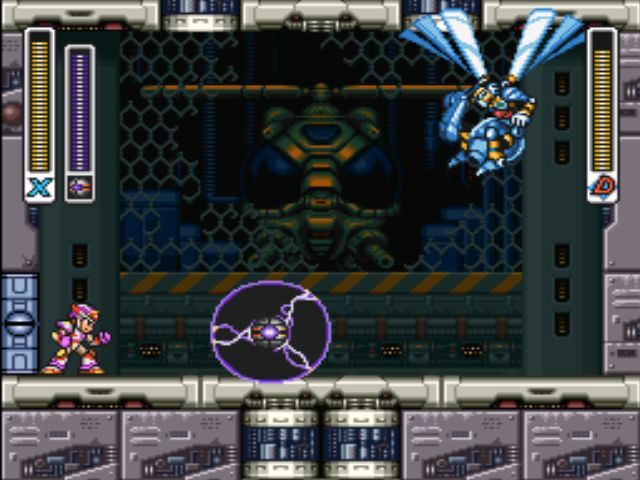 Also head back to Gravity Beetle's stage to get the heart tank there now that Blast Hornet is gone. 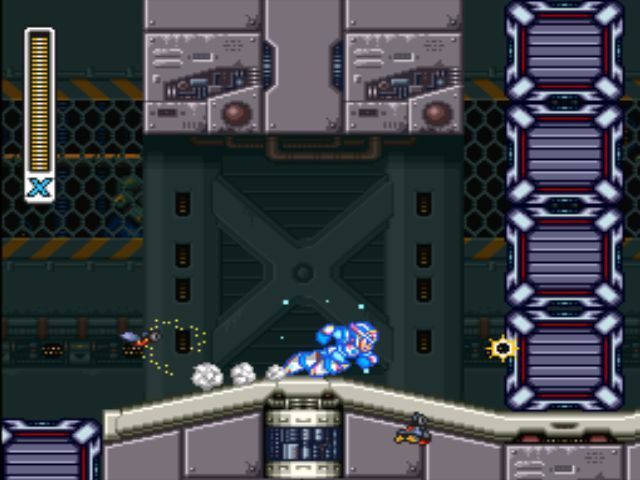 Finishing Blast Hornet's stage will replace all of the Head Gunner Customers with weaker Head Gunner Masspros. Once you have everything except the special chips, head to Dr. Doppler's lair.